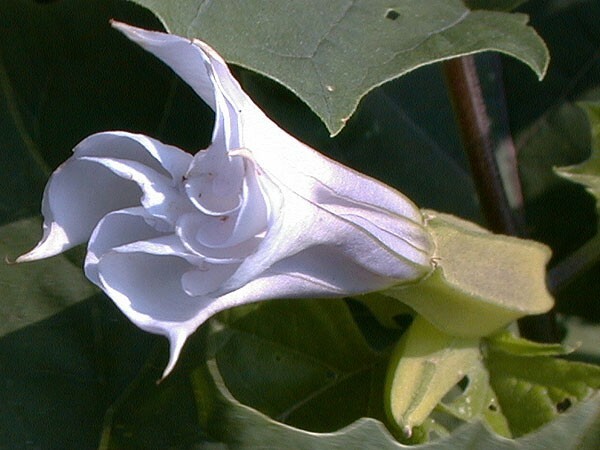 Datura is another member of the solanacea family. It is a cousin to Mandrake, Henbane, and Datura has been utilized as a shamanic, magical, and religious tool for centuries. She is a very powerful plant that the Aztecs considered to be sacred. Datura was sprinkled around the home to break spells. Leaves of datura were placed in pillows to help fight insomnia. Datura is an extremely poisonous plant. Their have been many reported fatalities from accidental poisoning and people seeking a thrill. We strongly discourage anyone who is contemplating ingesting any part of this plant. The shamans and indians who used this in the past where very knowledgable about the plant and its effects. Datura should be respected and admired for its beauty and long history of shamanic use. Datura is very easy to grow. It is a common weed in some places of the world. Sow in well draining potting soil and water occasionaly. Datura is very hardy and drought resistant.